Update: October 2016 – Confirmed that endangered Southern Resident L95 died due to an infection resulting from limpet tagging. Read news item here. Update: January 22, 2012 update to the December 10, 2010 blog item below: Approval granted to limpet tag the endangered southern resident killer whales. See news items at the end of the blog. The American “Northwest Fisheries Science Center” (NWFSC) has applied for expansion of their permit to satellite tag endangered and threatened whales with airguns, including the endangered Southern Resident killer whale population and the threatened Northern Residents and Transient populations (the range of all these whales very much includes British Columbian waters). It is the opinion of many involved in whale research and conservation that the impact of the airgun tagging far out weighs any benefit to the whales. There are other ways to get data on the movement of killer whales e.g. acoustic tracking and collaboration with researchers who have been studying these whales more extensively than NWFSC. It is my opinion that the tagging cannot provide data that will help reduce the threats of toxin accumulation, prey availability, disturbance or noise so – why do it? The photos here indicate just how invasive these types of tags are. 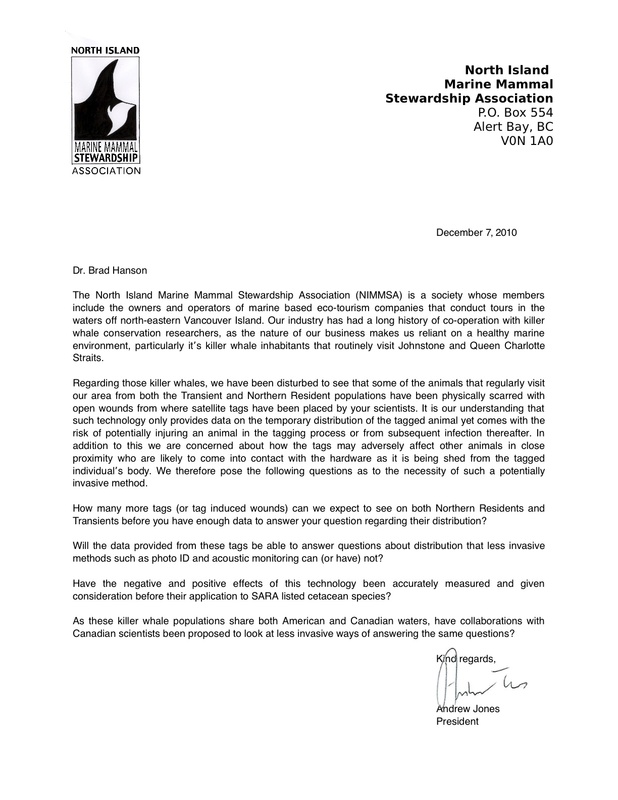 Below, I also include a letter from the North Island Marine Mammal Stewardship Association (NIMMSA) in which they powerfully express their concerns about the tagging. If you too are concerned about the merit of this tagging program, please help in creating awareness. Share this blog on Facebook; do what you want with the images (help them go viral) and provide coment via this link before December 23rd, 2010. Close up of the tag. NOAA Fisheries Services; Updates re. tagging killer whales. NOAA Fisheries Services; February 20, 2012; Announcement of first southern residents killer whale tagged, J26. All negative side effects of such invasive research must be provided. This would include the obvious harm to orcas. First there is the continuous harassment of them by research boats that is rightly illegal under WA legislation if done by the public. Further, orcas have reacted with obvious signs of fear as shown when the dorsal fins quiver. In one case the mom was painfully tagged and her two offspring quivered with fear. Infections that could kill the orcas cannot be ruled out. There should also be a required formal Environmental Impact Statement to evaluate the cumulative impacts these transboundary orcas are subject to by these experiments and all other research activities. opposition and having their work videotaped by us. These orcas may well become extinct so let’s not hasten their demise by such needless research. The main threat, as always to any of these creatures is and always will be “HUMANS”. What people/phd’ goof balls, and there are a lot of them. What they don’t get is that every animal , bird, cetatean, fish, bug that swims flys or farts on this planet make it clear in communicating with us, thye need to be left alone for a number of reasons, but we are constantly goin around trying one experiment after another in bogus science study in order to communicate with them and save them from civilization . Wake up you over waqnked science nerds, they are all , and I mean ALL OF THEM, ALL OF THEM are TRYING TO COMMUNICATE WITH US TOO’ It don’t take a degree to figure out what they are saying. No I don’t think they want to discuss the merits of your merit awards or your acceptance speeches -they are saying-‘Leave us some room’ . But we keep researching because we think the blah blah blah means some mysterious discovery and like Davinci, we profit from nature , Inextricably, we have interpreted what nature has designed only enough to kill them with it. I wrote a two part article on the tagging, and used one of your photos. It is credited to this site. Candace, your coverage is so good. Thank you!Have posted the link to your blog via Facebook on my page as well as the Orca Sighting’s network. I have become involved in marine mammal sustainability efforts and in particular naval sonar and whale tagging. In this effort noticed that your organization had submitted a letter opposing the use of barbed dart tags on Southern Resident Pod Orcas. Like your organization I also submitted my opposition. That letter can be found on the web site my daughter and I started in December (Champions for Cetaceans). Last week discovered that a similar research project was being requested for Gulf of Alaska and adjacent waters. Again this request file 5616 is to tag whales including the Transient Killer Whale Pod that moves through a broad range from California to the Bering Sea as you know. I am alarmed that no group seemed to be involved in any press releases or outcry concerning the implications of barbed dart tagging on a large cross section of whales. I live in Oregon, Cannon Beach to be exact, and strongly opposed proposed tagging of Southern Resident Pod Orcas, in Puget Sound (Salish Sea). This new file was posted by NOAA on Jan. 5 with a comment period ending Feb. 4, 2011. What I am asking for is help in defining a better network so this type of thing does not slip by without broader input from those who care. I have found the permit application at the link below. I see it is Craig Matkin’s. I am aware of his research and do not believe he has ever used a LIMPET tag. Will find out more. I feel like a dunce, as have spent at least better part of an hour trying to compose a response to you and off to cyber space it went. It looks like you might be close to finding the answer to the barbed hook question. The only reason we at Champions became concerned was over the issue of barbed hooks. Unfortunately the comment period ended on the Feb.4th as previously mentioned. It is awesome that you personally know at least one of the applicants however in my letter of opposition as you must have read as it was in my post, “Objection to Whale Barbed Dart Tagging NOAA 15616,” I feel slightly insulted that a lifted quote from that application, would be challenged. At least you know exactly what the application says; his reasons are the only remaining question. A further challenge would be, as I also mentioned in my NOAA submission, was the need to track a stock of killer whales whose remaining population is so small that this tagging process could traumatize to the point of causing the population to totally collapse. I am referring to the genetically unique stock of Prince William Residential Pod. It definitely concerns me that he did not specifically exclude this particular population. Granted I could not find a specific reference that he would specifically target said, but the grant application vagueness is the point. I have additional comments on the barbed hooked issue but it is late and will continue this at another time. Sorry that this response has taken so long, but my blog did not notify us that you had submitted a comment in the fashion that is customary. Until 22nd of Dec had zero knowledge about blogging not to mention the idiosyncrasies of WordPress. Until then Thanks for you response, Ed (Edward W. Johnson) Cannon Beach, OR. Hello Ed! This is the first comment I have seen from you and now see another one came in about 7 minutes later but posted to “Candace”(??). Please forgive me that I appear to have lost the plot line. Which quote of yours was lifted and applied where? I am so appreciative of the awareness you brought me about this application. Like I said last night did not notice your email response to my inquiry which I submitted on Feb. 10th. Further are you the Marine Detective, as it appears that one of your fellow members responded to that same inquiry. Sorry if his name slips but both of you seem extremely knowledgeable and passionate about your causes. The issue of Limpet. My knowledge on the topic until Dec was zero. My first involvement was triggered by some of the articles posted by Ken Balcomb and his team. I attempted to submit my objections to the NOAA on that issue and noticed on your web site, you had done the same and in fact used the same documents that the Whale Museum Board had submitted as well. Sub to our objection to the Salish Sea NOAA application, we became aware that a similar proposal had been submitted to NOAA for the Gulf of Alaska. The reason I became aware was through my regular internet search on Barbed Hook Dart Tagging. The date was early Feb. with the comment period ending of the 4th. Again just before the deadline I submitted my objections. Before tying that down will mention that NDFC was involved in attempting to get the indigenous population of the Hawaiian Island False Killer Whale listed. Hopefully my comments in support , for a change, were hopefully submitted. Again on this issue as well as the previous two mentioned NOAA applications, there seemed to be a big avoid of response from West Coast environmentally orientated groups. That is when I submitted the letter on Feb. 10 to which you responded. Finally LIMPETSin the Alaskian Gulf NOAA permit 15616. Below please find a copy of what I submitted, to NOAA. Please note that actual page numbers from any of the applicants submission are not referenced for which I apologize. My search has revealed a different assessment based on materials previously submitted to this agency by the Board of Directors the Whale Museum, Friday Harbor, Washington, relative to MMPA File No. 781-1824. 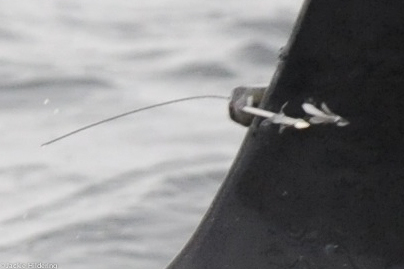 In that document pictures were included that show some barbs passing completely through the dorsal fin in one case, and of puncture wounds that had not healed within a reasonable period of time on another member to the Southern Resident Killer Whale Pod. When you attempt to represent the emotional response of Orcas when being tagged or biopsied as inconsequential, I take further offence. It remains to be seen but the evidence is still accumulating as to just how intelligent and adept their brains have become. In your application you identify noninvasive methods which would result in a greater accumulation of data and less physical risks. Both surface photographic identification and acoustical underwater monitoring have proven very effective. These non-invasive methods have resulted in a huge amount of data. What appears to be missing is the inclusion of this information in subsequent grant requests. In other words why more funding when previous grant findings have not been utilized to improve survival potential for these creatures. Sorry for it taking me more than a day to “approve” your comment. Lots of work pressure currently on another conservation issue. Thank you so much for this detail and I believe it very valuable that this comprehensive summary is included here. I am a member of the Marine Education and Research Society and, we submitted comments/objections. I should have been clearer about where my confusion lay – I did not know what quote you referred to in your comment “I feel slightly insulted that a lifted quote from that application, would be challenged”. Power to you for all your efforts.